“I remember when there were so many sharks in the bay, we couldn’t put a hook in the water without catching a shark,” recounted a patriarch fisher from the island of Utila in the Bay Islands in Honduras. This recollection of shark abundance is heard time and again with most Western Caribbean fishers over 50 years old. Today, it’s a different story. Sharks have been so heavily over-fished to feed the demand for white meat during the Lenten season and supplying fins for the seemingly insatiable demand for shark fin soup, that they are rarely encountered by today’s fishers. 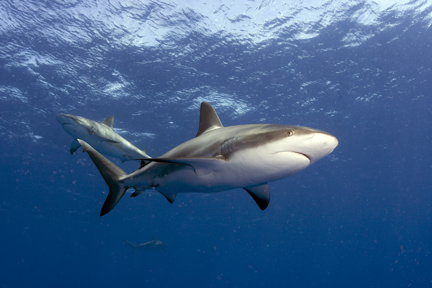 Sharks are seen even less frequently by divers, many of whom pay thousands of dollars for the opportunity to see sharks in the wild. Sadly, there are few places left in the world where sharks still abound and fulfill their ecological role of keeping prey populations in balance. While working to better understand sharks over the past fourteen years, I have often wondered whether the Swan Islands, a remote set of islands off the north coast of Honduras and only 350 miles east of my home in Punta Gorda, Belize, was one of these rare havens for sharks. My curiosity was further piqued when the President of Honduras declared a ban on shark fishing, potentially making the country into a shark sanctuary if the ban can be enforced. As luck would have it, wonderment turned to reality when I was invited to join an exploration cruise in the company of Dr. Sylvia Earle and her team. 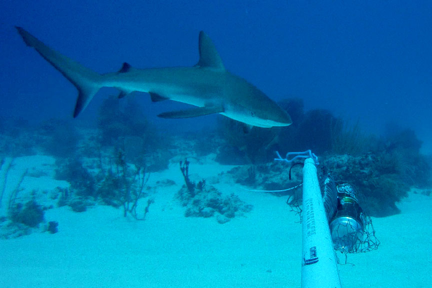 So we needed to find sharks quickly using a system that would reveal species diversity and relative abundance of both sharks and a range of other large fish. 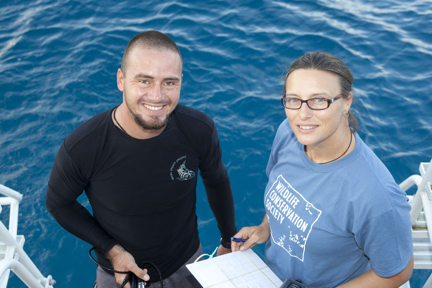 The team of divers surveying the coral reef for the Healthy Reef project is run by Dr. Melanie McField and a team of photographers were coming up practically empty-handed with counts of predatory fish including groupers, snappers, and jacks. It was clear from their surveys that the site had been heavily over-fished, and relatively recently….and sharks were nowhere to be seen. Contrary to the unthinking bloodthirsty portrayal we have erroneously bestowed upon sharks, they are smart and often very shy, staying far away from divers unless lured by bait. This is where the baited remote underwater video (BRUV) set-ups came into their own. These underwater video stations operate in a similar way to camera traps that biologists use to catch images of elusive terrestrial animals such as tigers or jaguars. After a very long crossing from Roatan, one of the Bay Islands off the north cost of Honduras, where we were literally rocking and rolling for 20 hours, we finally reached the Swan Islands. Working with Shark Legacy Project’s Giacomo Palavicini and the crew from the Aggressor, we quickly set up four underwater camera stations made of PVC pipes, wood, rope and a wide-angle video camera. The pièce de résistance was the long PVC arm placed in front of the camera, at the end of which dangled empty beer cans stuffed with mashed tuna steak tied to the pole with chicken wire– a simple yet functional design, which gives us insights into the secret lives of fish. And my expedition companions were kind enough to ensure a steady supply of “bait cans” during the course of the voyage. Science can be a tough mistress. Success! Our very first camera deployment came back with wonderful footage of a highly inquisitive juvenile female Caribbean reef shark. And it only got better from there. We all waited with great anticipation to pick up the BRUVs. So we doubled the deployments, parsed between deep and shallow waters and almost every deployment came back with footage of sharks, large grouper and barracudas checking out the bait and often rubbing themselves on the bait cans, like cats in thrall to the narcotic effects of catnip. On subsequent deployments we captured up to four sharks at a time buzzing the bait arm. Each revision of the camera footage would bring loud “WOOHOOs” and “Oh YEAH!s” from all folks. But the volume of whoops and hollers hit a crescendo with the appearance of a great hammerhead, nonchalantly swimming in front of one of the cameras, easily dispersing two smaller Caribbean reef sharks that had previously been monopolizing the bait. Globally endangered to extinction, great hammerheads are now so rare that seeing one is not only a treat but truly an honor. A great hammerhead’s tall dorsal fin, much prized in Asia for fin soup and a key driver for their gross decline, scythes through the water as its wondrous hammer-shaped head searches out the species’ favorite prey: the southern stingray. As we retire to our bunks following a long day at sea, I think about how this first day of the Swan Islands expedition has given me hope: that here perhaps exists one of the few remaining places on Earth where sharks are left alone to live in peace, much as they have for 400 million years…. And I can only wonder at what our array of underwater eyes will reveal tomorrow.